They lost in the CCL Final on penalty kicks to Guadalajara and everything fell apart. Their once juggernaut defense turned into a historically bad defense, and suddenly they were team who finished fourteen points off the playoff mark. As the season wore on and the decline persisted, fans and pundits were left putting the tragedy in context. Did the idea of the CCL chase distract them? Did the heartbreak crush their spirit? Or was it just a series of injuries and bad luck that pushed them off course? How fickle is this thing called greatness? And most importantly, how long will this slide continue? The numbers can explain the what, but they truly fail when it comes to explaining the why of Toronto FCs story. After scoring 74 goals and relinquishing just 37 in the great MLS Cup winning season, they scored just 59 and allowed 64 in 2018. TFC was able to increase their ownership of the ball, increasing possession from 51 to 53 percent. That had it’s advantages offensively but also came with a cost. TFC increased their shots per game from 12.9 to 14.3. The quality of those shots increased as well with their expected finishing rate increasing from 11.0 to 11.3 percent, yet goals slipped by 15. Most of that drop can be explained by their two main forwards. Sebastian Giovinco took 166 shots, 40 more than in 2017, yet his finishing rate slipped from 12.7 percent to a rather poor 7.8 percent. Jozy Altidore suffered through an injury plagued season and only took 27 shots for the year. Impressively he managed seven goals, but his drop in shots impacted the teams overall finishing rate. That increase in possession and shots opened up the game and appeared to put too much strain on a defense that was struggling through injuries. TFC allowed their opponent 13.6 shots per game up from 11.8 shots allowed in 2017. Put together, TFC games witnessed 13 percent more shots taken in 2018, indicating more open play. The story gets worse. The expected finishing rate on those opponent shots increased from an above average 9.9 to 11.4 percent in 2018, meaning not only were there more shots allowed, but they were significantly easier ones to make. Part of this is due to a revolving door along the defensive line. Defenders Justin Morrow, Drew Moor, Eric Zavaleta and Chris Mavinga appeared in a combined 127 game in 2017, but that same group appeared in just 62 games in 2018. Brazilian Auro and Gregory van der Weil picked up many of those games, but clearly the team was different. Where they applied defensive pressure also shifted in 2018. Here is a heat map of defensive actions between the two seasons. These assume TFC is defending the left, and attacking towards the right. The darker the red the more defensive actions occurred there. The percentages represent the percentage of their total defensive actions. There is a clear pressure line around middle third of the pitch during the 2017 season which lightens in 2018. The defensive pressure shifts more central and closer to the goal. During 2017 the team pressed in wide areas when in the attacking half, but that pressure became more evenly distributed in 2018. Here’s a horizontal only view of that same data. What is left is a team that has more possession but has shifted it’s defensive pressure closer to their own goal. That has the potential to leave wide spaces in the midfield for the opponent to exploit, or at the very least bring up the ball more comfortably. Exactly why these changes resulted in allowing 27 more goals year over year, a 73 percent increase, is still a mystery. Was it also a case of bad luck? Was there the same level of intensity? Did tactics change for the worse? It’s not a simple answer. It’s worth looking at Greg Vanney’s approach throughout the season as well. Vanney is a known tactical tinkerer. To some degree one can suppose that by looking at formation variety. Last season he led the league in formations used with eleven. Here’s how that compared to the other teams in the league. 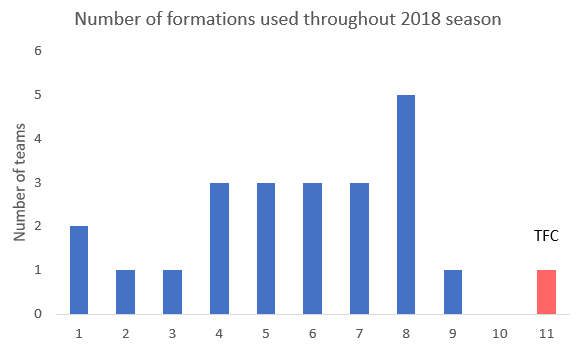 It’s worth nothing that playoff teams averaged 4.4 formations for the season while non-playoff teams averaged 7.3. During the 2017 run Vanney used just six formations. Was his hand forced due to injuries and the trending defensive woes, or did he contribute to the problem? Toronto fans would like to think that tragedy was just a one-off blip in an otherwise glorious run, but the offseason has been anything but kind. Gregory van der Weil, the defender with the most appearances last year, left the club, as did critical offensive glue Victor Vazquez, whose 16 goals over the last two seasons will be difficult to replace. But Toronto also lost a contract tangle with Giovinco and ultimately sold their star forward to the top club in Saudi Arabia. For a team that was hoping for a quick resurgence these departures all but ensure that some form of rebuild has to take place. Even if new GM Ali Curtis is able to replace these key pieces the team will take some time to gel. Curtis started by signing reclamation project Terrence Boyd. While Boyd is only 27 he’s scored just five goals in the last two years in Germany’s second tier. Whether or not he can get back to level where he was a prospect in the U.S. National Team pool is yet to be seen. This signing aligns with the word that Toronto is pulling back on their wage bill to a more sustainable level. That could be a factor in what level of talent replaces these key pieces and ultimately keep them from returning to the 2017 glory. Two big questions face TFC in 2019. Can Vanney and some stability fix a now awful defense? Most of the same players from 2017 are still there. And how can the offense be rebuilt without Giovinco and Vazquez? They will need a healthy Altidore and to spend on last minute talent to get to even the middling level they played at last season. But if the defense can get close to it’s 2017 self and the offense can improve throughout the year it’s possible for this team to make the playoffs. Just a return to the playoffs feels like an optimistic forecast, because the simple addition and subtraction math adds up to more of the same for Toronto. As novels like American Pastoral remind us, the causes of tragedy are often messy and unfair, and it’s certainly possible that those causes reverse direction, through some medium, just as quickly. Perhaps the trigger of their decline can now be their savior as they have a chance to start something new in this year’s CONCACAF Champions League. How else does one pull it together after a good run abruptly ends?